There is a sharp cut in the rate of making charges for jewellery and diamond processing industry, the Goods and Service Tax (GST) Council reduced the applicable rate on making charges from 18 per cent to just 5 per cent. “The GST Council has received 133 representations. An officers’ committee made recommendations after studying these representations. The GST Council has reduced the tax levels in 66 out these 133 cases. The diamond processing and others would attract a levy of five per cent now,” Union Finance Minister Arun Jaitley said while addressing a press conference after 16th GST meeting. 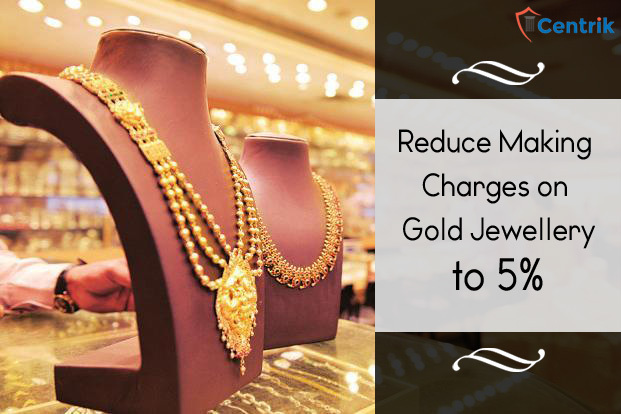 Tax Rate on Making Charges on Gold Jewellery slashed from 18% to just 5% by the GST Council. Before this GST regime, tax was exempted on jewellery making charges. Early this month, the GST Council meeting had fixed GST on precious metals and diamonds, including jewellery, at 3 per cent. However, tax on making charges of jewellery was kept at 18 per cent which would increase the tax burden for consumers to over 4 per cent, almost double of what was being currently charged in the form of 1 per cent each on VAT and excise on jewellery. This Reduction would make the tax compliance easy and help to reduce the fear of job loss because the Council’s earlier decision of 18 per cent attracted much dissatisfaction among jewellery manufacturers, as impractical and likely to cause immense job losses, as 95 per cent of jewellery is made on the basis of job work.